Hello there. I’m Jonathon. I work at UNIFIED – HIV Health and Beyond as the Health Education Coordinator. Three plus years ago I became HIV+. Since then I’ve experienced my ups and downs, but I keep myself getting through it with support from friends and family, helping others where I can, and maintaining a sense of humor no matter what. One way in which I am doing that is to share my experiences (adventures?) as a person living with HIV (PLHIV) who also works in the field. You can look forward to me sharing those with you a couple times a month. It’s my hope that my writings will prompt us to engage in progressive discussions about the state of HIV today. I also hope that anyone reading will be inspired to share their own stories. I shared my first day story on thebody.com. You can view it here and you will see snippets peppered into my ongoing posts. After I tested positive, I received the “first day” welcome kit of a blood draw, pamphlets, referrals, and you-must-use-condoms-now finger-waggings . Then, I arrived home to begin coping. I felt like I was beginning the same transition you witness in old vampire and werewolf films. I noticed little changes here and there. After a while, the changes felt deeper like every bug bite or blood cell had mutated into weird little monsters. After a while, I didn’t even realize I had a fever until it began dissipating. I fell asleep and woke up a few hours later. But instead of waking up with powers or sharper teeth or fur all over, I felt exactly the same. And the fever had been a result of emotions. My blood felt the same inside me, and I would soon learn it looks the same. I was beginning the (still ongoing) grieving process. Although I was still reeling from the werewolf episode, the day after my confirmatory result was also my first day back at work. At the time, I was working at a housewares store–the brand at which I had worked for five intermittent years. When I started that night’s shift, I’d mostly forgotten about my transition into a mutant. As happened too often at this job, I cut my finger on something. Getting cut is inevitable at this home store. Between glass, cardboard, splintered wood, and unloading trucks, getting cut is inevitable at this homestore; I endured hands covered in bandages on the weekly. I did not see it coming but this first day as a new creature gave me a crash-course in accepting myself as-is. As soon as I cut my finger on a broken vase that a customer left sitting on a shelf, I was transported to a Tarantino film. Blood sprayed from my hand, and then from my fingertips. Each blink changed my surroundings between neon colors like I was in an early iPod commercial-turned-horror film. I rushed to the restroom, locked myself in, grabbed a wad of paper towel, and crouched into a vertical version of the fetal position. I stayed in the restroom for half an hour as I worried about what I should do. I knew I needed to rinse off my hand but I was afraid to get blood on the faucet handles. I finally overcame my dread and turned on the water. Instead of sticking my now mostly dried, bloody hand into the water, I plunged my face into the cascade and washed away the irrationality. I cleaned my hands, cleaned the minimal blood off the sink, and left the restroom to dress the wound as though nothing was out of the ordinary. To this day, I still have a small panicked feeling when I see my blood. This feeling diminishes the more I learn about HIV and how being undetectable equals untransmittable. Speaking of undetectable, I will be sharing many posts grappling with the drama and trauma of being a patient and a case worker/educator. Months after testing reactive, I volunteered at UNIFIED (formerly AIDS Partnership Michigan). I didn’t know how to talk about HIV or what I was going through. It was easier to say I was “fine” and gulp than to own up to my not knowing what the hell to do or say. But I showed up, answered calls on the Michigan HIV/STD Hotline (800-872-2437), and covered the front desk. 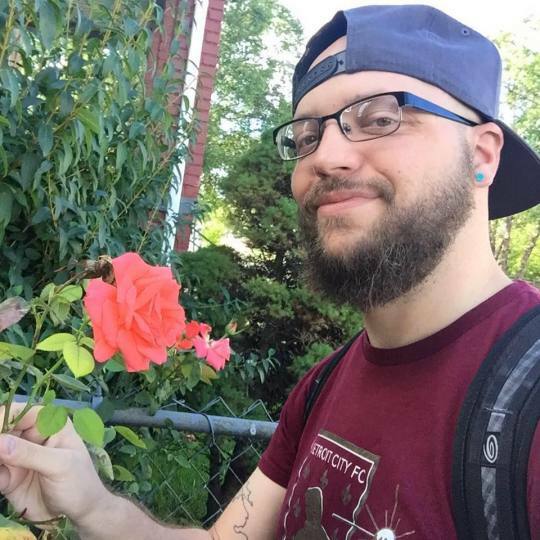 My time volunteering allowed me to hone my communication skills while building confidence in the facts surrounding HIV and how I engaged with them. I then gained knowledge and confidence working on and off with CARES of SW Michigan and Mr. Friendly to co-facilitate weekend camps for positive men. We learned about disclosure, healthy relationships, and the ongoing science behind HIV. This involvement put me right in the middle of being a person with HIV as well as a counselor for my peers. I spent my first year employed with UNIFIED as a Linkage to Care Specialist. I worked with newly diagnosed individuals, those who had fallen out of care, and those who had recently relocated to Metro-Detroit. I went through Linkage to Care as a client and when I had the opportunity to switch sides and become the specialist, I was anxious and excited. I had never had a “real job” before. Taking that opportunity lead me to an even better one, and two months ago I became the Health Education Coordinator at UNIFIED. This position has me in charge of support and education groups, building and maintaining partnerships with peer AIDS service organizations (ASOs), medical clinics, and community agencies offering services to address needs well beyond HIV care. Beside working at UNIFIED, I participate in panels and discussions as a PLHIV, work on the draft of an autobiography, and write letters to my legislators imploring them to support drastic augmentation to the Michigan HIV Disclosure Law. Lastly, I am working on a website that will offer a space for PLHIV and their loved ones to share their stories. This project has many logistics and barriers to deal with and I am moving very slowly. If you are inclined to help, I would never decline. Thank you for reading and I look forward to offering you more insights and anecdotes about how I got to being more than just “fine.” Whew. It was really nice to write about myself without it being on a dating app. An ample part of UNIFIED’s tobacco reduction program includes creating quit kits for clients. During the initial assessment, we bring out the quit kit while discussing possible quit dates. Each client accessing tobacco reduction services receives 1 quit kit for their time working with the tobacco treatment specialist. Each quit kit includes: a journal, pens, candy/gum, educational tools, and fidget toys. Journal- The journal is an especially important piece of the quit kit. The journal is a good tool to help keep track of a person’s smoking habits prior to their quit date. Many clients use it to write down when they have cravings, what they are doing when they have cravings, and how they are feeling when they have a craving. This will help the tobacco treatment specialist and client to better come up with coping mechanisms and a quit plan together for when the client experiences cravings. For example, if Mike records that he has a craving every time he is feeling bored then coming up with things for Mike to do while he is bored can help combat cravings. Pens- The pens are good for when the client needs to journal. We put 2-3 different colored pens in each quit kit to make it easier for the client to be able to journal. Pens can also act as a fidget toy. Candy/Gum- Each quit kit comes with a variety of candy. We use Twizzlers, Life Savers, and mints normally. The Twizzlers can help with the hand to mouth habit of smoking. It is a similar shape to a cigarette. The Life Savers, mints, and gum are good at combating the oral fixation that often comes with smokers. 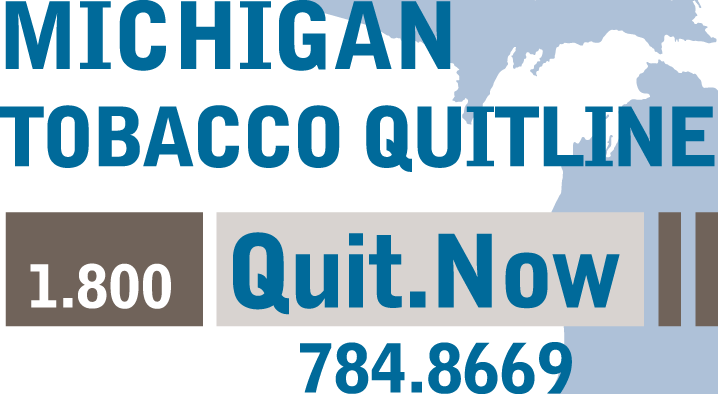 Educational Tools- In each quit kit, we put a pamphlet for the Michigan Tobacco Quit Line. In the pamphlet, it gives little facts on how smoking affects the body as well as the number to the Quit Line for clients to utilize. We also include a UNIFIED Tobacco Services palm card that has contact information and HIV and Tobacco use facts. As an added bonus, we include the Michigan HIV/STD Hotline number. Fidget Toys- Each quit kit includes rubber bands that are used by switching wrists when a craving occurs. It helps to keep the hands and mind busy. Additionally, each client gets to choose another fidget toy. We have two different options. One is a bike chain fidget toy that is small enough to fit in a pants pocket. The other is a Bendeez toy that can be molded into different shapes. Both are used to help combat boredom and keep the hands and mind busy. All of these items have gotten positive feedback from current tobacco clients. If you are a current tobacco user and you think that a quit kit would be beneficial to your quit/reduction attempt, please contact UNIFIED- HIV Health and Beyond to meet with a Tobacco Treatment Specialist!